Jon Ratcliffe has climbed the obvious sit down start to Floppy's Arete in Area 6 of Porth Ysgo. 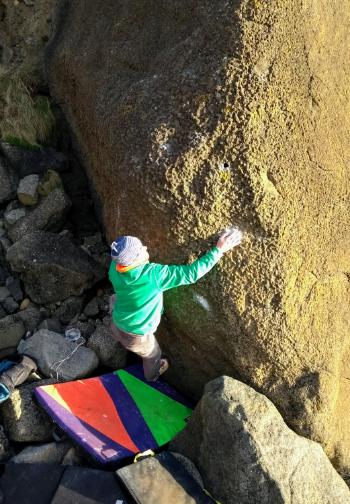 Flipping Floppy features some intense moves on marginal holds and rates 7A+/B. The hillside at the back of Area 2 continues to slump - the latest collapse saw some large boulders fall onto the beach. The best descent currently in this area is via the stream. Unfortunately Stowaway 7B+ is blocked by one of the boulders.